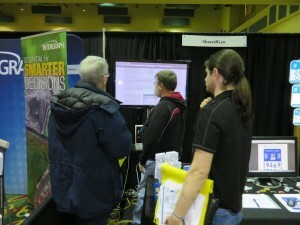 Technical Director Bob Basques mans the SharedGeo booth. conference focused on making the vision of Wisconsin’s GIS future into a reality and served as a platform to showcase the latest open source technology–including SharedGeo’s shared funding project, GeoMOOSE. statewide adoption by snowmobile clubs and other outdoor enthusiasts. web viewer instead of a commercial package. Mr. Basques also demonstrated AVL production services in a live view mode.